With much of the Northeast bracing for a powerful nor’easter, Cherry Hill Township and our Department of Public Works stand ready to respond as conditions require over the next 12 to 18 hours. According to the latest forecast from the National Weather Service, as much as 3 inches of snow could fall across Cherry Hill beginning at about 7 tonight. Public Works trucks have been outfitted with snow plows and salt spreaders, and crews will work through the night to ensure our roads remain as clear and safe as possible. We continue to monitor local conditions and will adjust our effort accordingly. Snow and ice could cause hazardous conditions on the roads overnight; please restrict travel as much as possible, and use extreme caution and your best judgment if driving is unavoidable. For more information on the Township’s winter weather preparations, click here. To read about PSE&G preparations for tonight’s storm, click here. The Cherry Hill Public School District has cancelled all middle-school activities for Saturday, Feb. 9, because of the weather. At Beck, this includes the Chinese School, Rec. Basketball and Travel Basketball; at Carusi, Rec. Basketball; and at Rosa, Rec. Basketball and Red Raiders Basketball. Click here for additional cancellations and more school district news. This past Tuesday, I had the honor of speaking to the members of the Cherry Hill Chamber of Commerce at a special breakfast event at the Holiday Inn on Route 70. 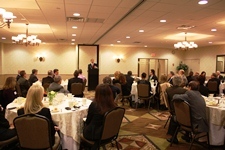 I updated the group – about 45 members of the local business community, as well as representatives from the Township and the Cherry Hill Board of Education – on my first year in office, outlined my goals for 2013, and answered questions about a number of topics of interest to local residents. Thank you to the Chamber for organizing the breakfast, and the Holiday Inn for serving as host. It was a wonderful event, and I hope to make it a regular occurrence! I am pleased to announce that Cherry Hill has been awarded $24,000 for trail enhancements through the New Jersey Department of Environmental Protection and the Federal Highway Administration’s 2012 Recreation Trails Program. These funds will enable the Township to further enhance and improve our existing trail system, by extension promoting public health and an appreciation of outdoor recreation. Our Township’s open spaces are an important asset to maintain and promote, and I look forward to sharing information on future improvement and enhancement efforts in the months to come. 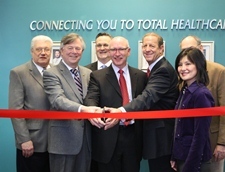 On Tuesday, I attended a community open house and ribbon-cutting for the new Kennedy Health Alliance offices on Haddonfield Road, inside the Liberty View office complex. The Health Alliance, part of the Kennedy Health System, offers patience access to a variety of healthcare specialties outside of the traditional hospital setting. The office space is beautiful, and with physicians who specialize in dermatology, endocrinology, headache treatments and more, this will no doubt be a valuable resource for many, many residents. Kennedy remains a top health-care provider for Cherry Hill and the entire region, and I’m proud to welcome the latest member of their family into our community. The AARP and Cherry Hill Township have once again partnered to offer free tax preparation assistance to residents ages 55 and older. Sessions will be held from 10 a.m. to 2 p.m. every Tuesday and Friday through April 12 in the N. John Amato Council Chambers (Room 208) at Town Hall. No appointment is necessary. Preparing your tax return can be a daunting task; please take advantage of this valuable service! For more information, click here. Public Works trucks have been outfitted with snow plows and salt spreaders, and crews will work through the night to ensure our roads remain as clear and safe as possible. We continue to monitor local conditions and will adjust our effort accordingly. Snow and ice could cause hazardous conditions on the roads overnight; please restrict travel as much as possible, and use extreme caution and your best judgment if driving is unavoidable. For more information on the Township’s winter weather preparations, click here [http://www.cherryhill-nj.com/CivicAlerts.aspx?AID=221] . To read about PSE&G preparations for tonight’s storm, click here [http://www.pseg.com/info/media/newsreleases/2013/2013-02-07.jsp#.URVrmqycTXU] . The Cherry Hill Public School District has cancelled all middle-school activities for Saturday, Feb. 9, because of the weather. At Beck, this includes the Chinese School, Rec. Basketball and Travel Basketball; at Carusi, Rec. Basketball; and at Rosa, Rec. Basketball and Red Raiders Basketball. Click here [http://www.cherryhill.k12.nj.us/news/news/enews.cfm] for additional cancellations and more school district news. The AARP and Cherry Hill Township have once again partnered to offer free tax preparation assistance to residents ages 55 and older. Sessions will be held from 10 a.m. to 2 p.m. every Tuesday and Friday through April 12 in the N. John Amato Council Chambers (Room 208) at Town Hall. No appointment is necessary. Preparing your tax return can be a daunting task; please take advantage of this valuable service! For more information, click here [http://www.cherryhill-nj.com/CivicAlerts.aspx?AID=218] .